As you know, my wife had her foot operated on last Friday. While I was in the ICU waiting room, a young man was waiting with his Sister? Wife’s Sister?, not sure, but he was waiting for his Wife to get out of surgery. I had been talking with the volunteer lady about fishing. You know me, once I get into talking about fishing, it could go on for hours. The four of us continued chatting and then Daniel asked if I’ve ever been noodling? I think you know my reply. I’m not going into dirty water and sticking my hand in a hole to grab, what? A Catfish, Snapping turtle, Rattlesnake? I don’t think so. Seems Daniel had done some when he was back in Kansas. 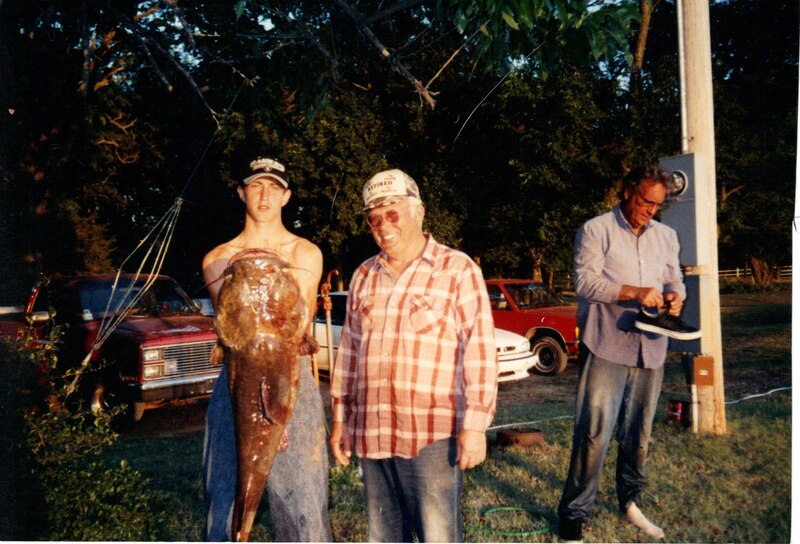 He sent me this photo of his 45 pound Flathead Catfish he caught in the Arkansas River. There you have it, my friends. A noodler in the flesh. Tomorrow, take a friend fishing. I'll grab a salmon in a river but draw the line when it comes to rooting around in holes on the bank. That takes a special kind of crazy! I wonder why it's called noodling. It's got to be hard to swim up to the surface when you have a 40+lb fish stuck to your arm. Well Thanks Mark. More nightmares tonight. No thanks! I wouldn't mind watching a bunch of female noodlers, though, come to think of it. Tee Hee! If you lived here then you would be surrounded by noodlers. That's a past time for many here down on the Licking River.